Due to holidays and other reasons I am offering in the one post reflections on three Sundays in January 2014. I am treating Sunday 5 January as Epiphany = 6 January. Noting the remarks above (Sunday 12 January) about Isaiah's 'servant songs'; this is the second of the four servant songs. In the season of Epiphany we think about the revelation of God through Jesus Christ. Here Paul writes his introduction to 1 Corinthians and talks of 'the revealing of our Lord Jesus Christ'. In that particular verse, 5, the emphasis falls on the revelation to come when Christ returns. But Paul also talks about what has been revealed in and through Jesus so that the Corinthians have been 'enriched in him' (v. 5), and 'not lacking any spiritual gift' (v. 7). Soon Paul will talk about the wisdom found in Christ (1:18-31) and later will talk about the spiritual gifts which include those which reveal divine knowledg (chapters 12 and 14). An oddity of church history combined with the lectionary means that this Sunday we read Matthew 2:13-23 (Flight of the Holy Family to Egypt) and next Sunday (should we celebrate the Feast of Epiphany a day early) we would read Matthew 2:1-12 (Epiphany of Our Lord Jesus Christ). Note re Christmas: I am not going to post about Christmas services. The possible themes and the appointed readings are, let us say, familiar! But if stuck for a theme, here is one, pinched from a colleague: "Joy". I hope to be able to sustain posts through Sundays 29 December and January. In this brief reading we do not need to get stuck on any particular point (though preachers do do that!). Essentially Matthew tells us three salient facts: the conception of Jesus was a divine act according to a divine plan; the name of Jesus meant something important: it summarised his purpose, to save people from their sin; Jesus was born as a baby with a mum. Apropos of using the lectionary in our church life together, Bosco Peters has a challenging post at Liturgy. 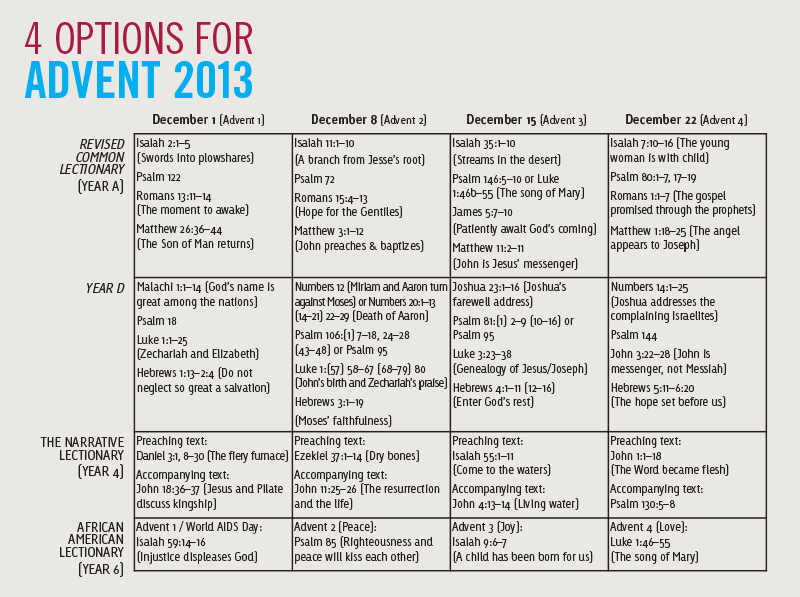 In that post he draws attention to an intriguing comparative table which demonstrates four lectionary options for Advent 2013. (These are not options for licensed Anglican clergy of the Anglican Church of Aotearoa New Zealand and Polynesia for whom the RCL is the only one of the four lectionaries listed which is permitted for usage). Do you have a favourite collect or top five favourite collects? Cranmer's Curate offers one of his favourites here. In other words, Israel, theologically and psychologically could hold their heads up high. The promises of God were true, the exile was a hiccup and not the end of Israel or of Israel's God. Indeed the future spelled out here in certain ways was to be more glorious than the most glorious past of Israel (i.e. when David was king). John the Baptist in prison finds his mind going round the bend. He has discharged his prophetic ministry at great cost. The central theme of that ministry was announcing the coming of the Lord's Anointed One (or Messiah). He thought the Messiah was Jesus. Now he is not so sure. As any of us would do, he decides to check up on what is happening. Perhaps Jesus was just a bit like the Messiah-of-expectation but not the actual Messiah. 1. Verse 4 is an endorsement of the importance of the Old Testament for Christians: 'whatever was written in former days was written for our instriction, so that by steadfastness and by the encouragement of the scripture we might have hope.' Within this passage this verse also functions to chart where Paul is about to go in verses 8-12: the glory and greatness of Christ includes the wonderful note that his coming into the world is fulfilment of scriptural promises and visions. 2. Verses 5-7 and 12 offer a picture of wholesome life in the church when we understand who Christ is: steadfastness and encouragement; harmony and unity; welcoming fellowship together; marked by joy, peace, and hope. What is not to like! Recall that chapter 15 is at the end of this long epistle. Paul is setting out his closing thoughts as he brings an amazing theological journey (chapters 1-11) joined with a challenging application pathway (chapters 12-16) to an end. Like a musical composer who brings notes sounded at the beginning into the ending of his piece, and maps out the ending with notes at the beginning that will be reinforced as the whole ending is played out, Paul says some things which recall what has gone before while charting how the future of the church should look. What is (the adult) John the Baptist doing in the run up to Christmas?! There are two possible ways to think about this reading in Advent (the season of coming). First, John the Baptist is preparing for the coming of Jesus' mission and ministry so this gospel reading reminds us that Jesus didn't just come to be an adorable baby but to do something for God. Secondly, as we think in Advent about Jesus' second coming, we think about judgment and this reading is full of judgment! 'You brood of vipers!' Etc.